I joined Grand Rounds in 2013 as one of the first 10 employees. An important consideration for me was joining a company that would remain focused on culture and providing world-class service as we grew. Almost five years later, we’ve grown 3600%, expanded from one to three sites, and have a robust remote workforce around the country. We’ve also expanded our services, reaching 3.5 million covered lives and serving over 100 progressive employers across the country. Throughout this rapid growth we’ve stayed true to our core values and focused on our culture – resulting in an award-winning team for “best places to work” as well as customer service. 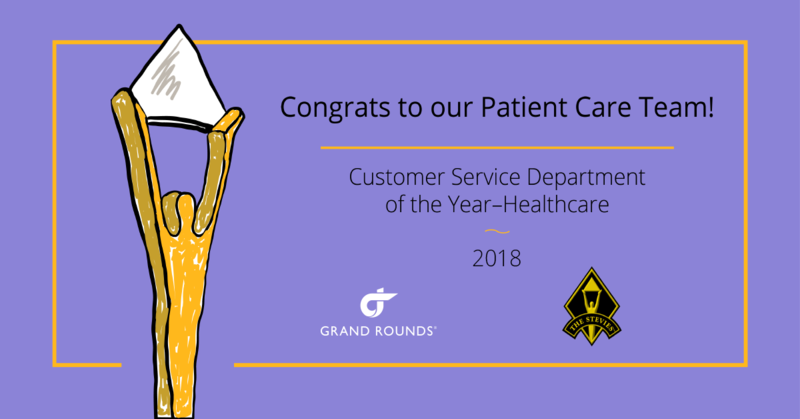 Today, Grand Rounds celebrates that our Patient Care team has received the Gold Stevie® Award for Customer Service Department of the Year for the fifth straight year in a row! At Grand Rounds, we invest in building a great culture because we believe this ultimately leads to exceptional customer service, which has been proven time and again — five times in a row! For those who are not familiar, the Stevies are highly coveted business awards for the customer service industry. To be recognized for the fifth year in a row is a true testament to the team’s focus on our core values and unyielding dedication to and passion for our patients and mission. Our values lay the foundation for the ways we expect our co-workers to behave. For every employee at Grand Rounds, and especially for our leaders, it’s critical to not only talk about our values but to demonstrate living those values every day. Put Patients First – always, even if it means hanging up on our CEO. We empathize and advocate, because we’re all patients. Drive Healthy Debate – question with courage; listen with humility; debates ideas not people. Bring Your Best Self – act with integrity; offer kindness, curiosity, and humor; be honest and direct; assume best intent. Get Stuff Done: Stuff That Matters – set big goals and go after them; keep your word; hold yourself and others accountable; aim for impact, not perfection; deliver results that matter.With our Patient Care team focused on putting patients first, bringing their best selves, and doing stuff that matters this naturally leads to high-quality customer service. Hire for skill and alignment to values In an ideal world, you hire people with both the skills you need and who share your core values. If forced to choose, I’d pick smart and aligned to our values over skills every time. People learn new skills every day. It’s significantly harder to change a person’s core values. And frankly, when you’re changing healthcare, you must adapt and learn new skills as you drive change. When someone is delivering standout performance and living our values, it is important to recognize this privately and publicly. It helps reinforce throughout the company what we believe makes us special, and successful. It lets employees know that they are valued. The Stevie Award is a direct reflection of how a values-based culture can keep large teams focused on what truly matters. Whether supporting member #1 or member #3,000,000, it comes with great pride to say that our Care Team will continue to serve our member population with the utmost respect, empathy, and care. This is a team that works tirelessly to help patients through life’s toughest moments, with unyielding empathy and skill. And yet at the end of the day, this team has even more to give. To each other and to our culture. Congratulations on this well-deserved award and thank you for your commitment to helping our members every single day. 19th Annual Employee Health Care Conference - New York. Join us. Business Health Agenda 2019. Join us. how it all works for you. Request a demo to learn more about how you can get the best for your employees. A representative will follow up with you as soon as possible.